Every soldering iron has three characteristics: a WATTAGE (power) rating, a weight or MASS, and a TIME CONSTANT, which results from the first two characteristic’s. The TIME CONSTANT is proportional to how much WATTAGE the iron has, divided by how much MASS it has. The bigger the WATTAGE, the more melting work the iron can accomplish in any given period of time. The bigger the MASS or weight of the iron the slower it will be to change temperature, either when it is heating up or when it is cooling down. A useful analogy is to think of the iron like a car, with the temperature of the iron represented by the speed of the car, and the weight of the iron by the weight of the car. The wattage is like the size of the engine. Think of the voltage control, if you are using one, not as a device for setting the temperature, but rather as a rate-of-energy-input control. Turning up the voltage control is like stepping on the gas pedal. The temperature will rise, at a rate which depends on the TIME CONSTANT of the iron. If a soldering iron is not doing work, but just idling, it will not need much energy put into it. A setting of 3 of 4 on the control box will usually be about right. Wipe your iron frequently with a lightly moistened piece of rag, terrycloth, cotton or linen but not acrylic or artificial fiber. The tip should get shiny silver-colored and stay that way. Any time you see the iron turn blue or yellow immediately after you wipe it, it is TOO HOT. When the iron is melting a lot of solder, a lot of heat will be taken out of it, so a much higher control setting is needed. Big heavy, irons with large MASS are useful for lead-came work because their mass stores a lot of heat and therefore they don’t drop abruptly in temperature when they come in contact with a lot of cold metal. 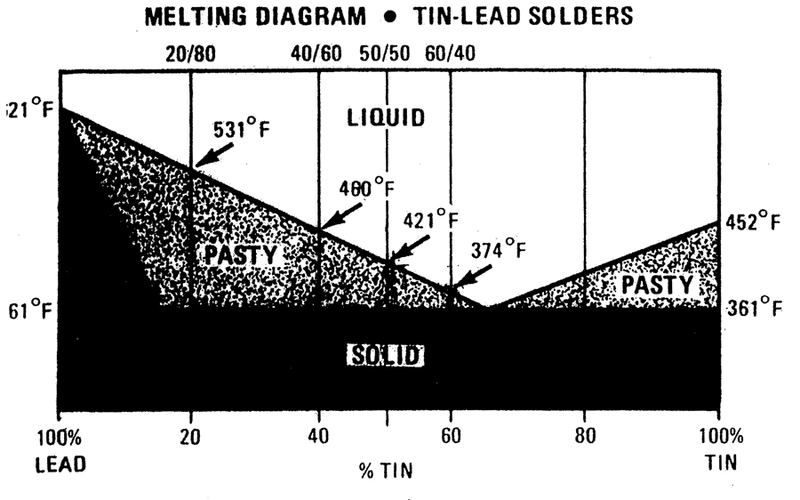 Another useful feature of having all that mass is that it prevents the temperature from rising quickly, making it less likely that the iron will melt through lead or zinc came channel. Small irons with light weight are often favored for copper-foil soldering. Irons like the Weller 1140 have very low mass, and a high efficiency ceramic heat cartridge instead of wire-wound heat coil. This gives them the capacity to provide a lot of heat very quickly when the voltage control is turned up, but it also gives them a tendency to overheat very quickly when the iron is not doing work. TURN THESE IRONS DOWN IMMEDIATELY when you finish soldering.